What does it take to get people to flee a storm? Waves crash ashore near the Verrazano Bridge in Brooklyn, N.Y., ahead of Hurricane Sandy's landfall on Monday, Oct. 29. NEW YORK (AP) — Despite days of dire forecasts and explicit warnings, hundreds of thousands of people in New York and New Jersey ignored mandatory evacuation orders as Superstorm Sandy closed in. Now, after scores of deaths and harrowing escapes, emergency officials say they will look at what more can be done to persuade residents to get out when their lives are in danger. "The issue of those who either can't or won't abide by those orders — that is a question that we have to address," Homeland Security Secretary Janet Napolitano said during a tour of ravaged Staten Island over the weekend. The same troubling pattern has been seen in previous storms, and the ideas tried across the country include stern warnings about the dangers of staying behind, moral appeals not to imperil rescuers, scary ads, and laws that threaten fines or jail time. And yet people refuse to leave, and some come to regret it — that is, if they survive. "Staying there was the stupidest thing I've ever done," acknowledged Steve Shapiro, a 55-year-old Staten Island resident who witnessed Sandy's surge lift nearby houses off their foundations. Two of his neighbors, a 13-year-old girl and her 55-year-old father, died when the rushing water destroyed their house. Brooklyn Borough President Marty Markowitz said officials should work to make sure residents can feel safe in shelters and confident their homes will be safeguarded in their absence. But New York Mayor Michael Bloomberg, it's a matter of changing minds, not tactics. The city notified people by such means as automated phone calls and sending around police officers with loudspeakers. "People have got to start learning that when we say something, we mean it — it's based on the best prognostication," he said. Hurricane Katrina, which killed more than 1,800 people and left others stranded for days on roofs, in attics and on streets in flooded New Orleans in 2005, starkly illustrated to the rest of the country the importance of getting out. Often, though, people believe that a storm won't be so bad or that their homes are built tough enough. Some want to avoid shelters or the expense of staying in a hotel. Still others worry that their homes will be looted. Florida State University professor Jay Baker, who has studied the subject for decades, said it is not unusual for one-third to half of all residents to defy mandatory evacuation orders, especially in places that haven't been hit hard recently. Sandy was blamed for more than 100 deaths in 10 states, with many victims drowning in their homes or while belatedly trying to escape. In New York City alone, 35 of the 43 deaths were from drowning, largely in areas ordered to evacuate. Other people survived after police and firefighters risked their lives in churning floodwaters to reach them. Only about half of the more than 350,000 people in New York City who were told to flee did so, officials say. 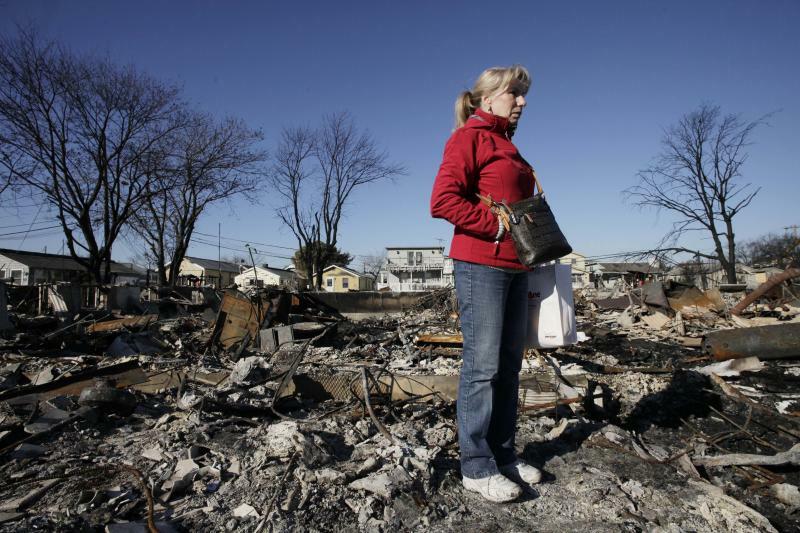 New Jersey officials estimated 90 percent of the 115,000 people ordered to evacuate obeyed. But the areas under mandatory orders in New Jersey included many vacation homes. In New York, the threatened neighborhoods consisted mostly of year-round homes. Ginger Matthews has lived all her 59 years in Long Beach, N.Y., long enough to remember Hurricane Donna's strike nearby in 1960. But determined to watch over her home and the coin laundry she owns nearby, she defied evacuation orders. "I would never have imagined something so devastating," she recalled later, after at least 4 feet of water rushed into the newly refinished downstairs apartment in her split-level home. "Nobody would have convinced me to leave. ... I wanted to be here to prevent anything if it was going to happen. But that was senseless." 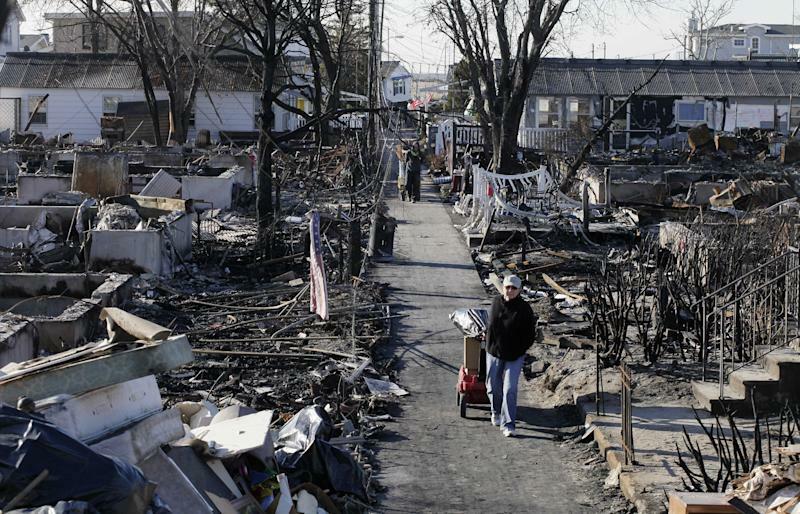 In urging evacuations before Sandy, officials around the metropolitan area sounded a note of moral obligation: Think of the emergency workers who might have to risk their lives to rescue you. As New Jersey Gov. Chris Christie put it in his usual sledgehammer style, staying is "both stupid and selfish." Some states make it a crime to ignore an evacuation order. North Carolina recently raised the potential fine from $200 to $1,000 and the possible jail term from 20 to 60 days. New York has a similar law that carries up to 90 days in jail. Still, it's unclear how often such laws are enforced, if ever. Indeed, Bloomberg said there would be no arrests in the city for defying evacuation orders during Sandy. Some scholars suggest it's legally possible to force people to leave. It could be seen as analogous to quarantining people in disease outbreaks, said Amy Fairchild, a Columbia University public health professor who co-wrote a paper on the subject. But in general, the image of forcing people out of their homes, or arresting them for staying, has little political or practical appeal. Under a principle known as the rescue doctrine, a rescuer who gets hurt saving someone can sue if the emergency was the result of negligence. That arguably could apply if an emergency worker was injured rescuing someone who ignored an order to evacuate, said Hayes Hunt, a Philadelphia lawyer who mulled over the issue on his blog, From the Sidebar. It's not clear, though, whether any emergency department would want to take that step against a citizen. Some communities ask residents to sign waivers documenting their refusal to leave — a tactic that drives home the danger. As hurricane season started in 2006, Florida launched controversial ads featuring genuine, panicky 911 calls from people begging for help during 2004's Hurricane Ivan and being told it was too dangerous to send rescuers. It's unclear exactly what effect such scare strategies have on evacuation rates, though. The most effective approach? Going door-to-door to tell residents in person that they should flee, but that's often impossible with big populations and short timeframes, said Florida State's Baker. It can help to enlist community leaders to spread the word, so people hear it repeatedly from trusted figures and not just from politicians at podiums, said Richard Olson, a disaster risk specialist at Florida International University in Miami. And officials and scientists might look for a more easily understood way to explain the threat of a storm's surge, now often expressed as a number of feet above normal tides, said Arthur Lerner-Lam, a disaster risk assessment expert at Columbia University's Lamont-Doherty Earth Observatory. But what might be most likely to persuade people to flee a hazardous storm is simply having been through one before. "Obviously, next time, I'll leave," said Shapiro, the Staten Islander. "No question about it." Associated Press writers Tom Hays in New York, Frank Eltman in Long Beach, N.Y., and John Christoffersen in Fairfield, Conn., contributed to this report.